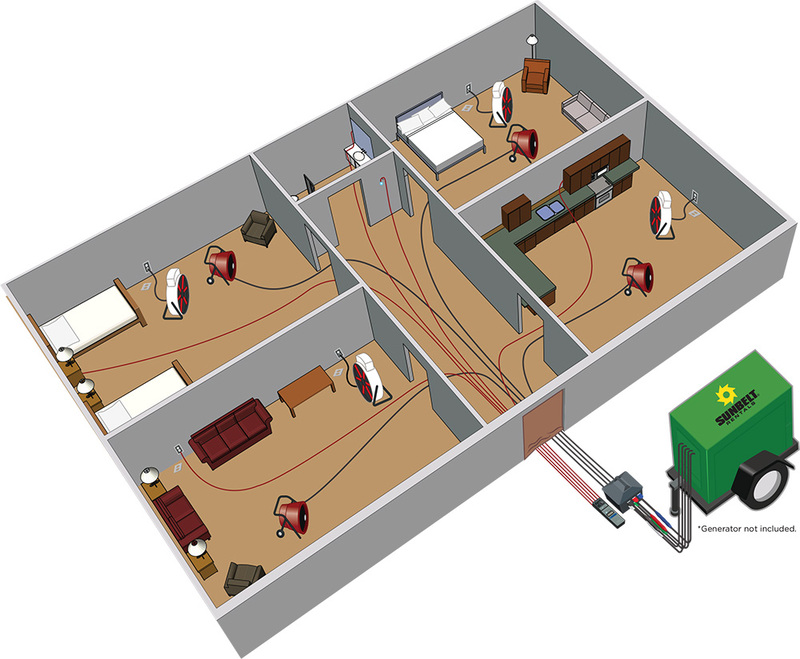 How does the Pest-Heat System work? 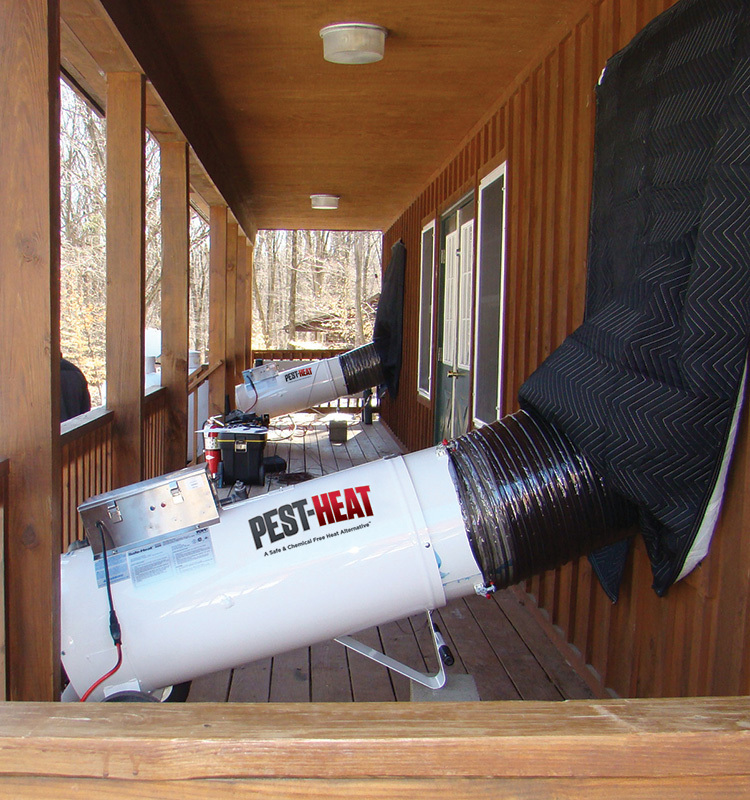 The Pest-Heat treatment process delivers controlled, evenly distributed heat throughout a structure for several hours with high volumes of air movement while recording and monitoring temperatures. During a typical heat treatment process, internal temperatures are slowly raised in the space to a target temperature of 120°F to 140°F and then held for several hours. 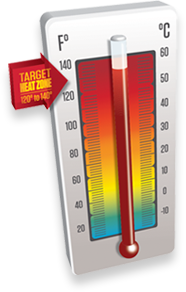 Achieving this temperature in the cracks, crevices, and hard-to-reach places is necessary for the heat to effectively penetrate and kill the entire life cycle of bedbugs, from eggs to adults. 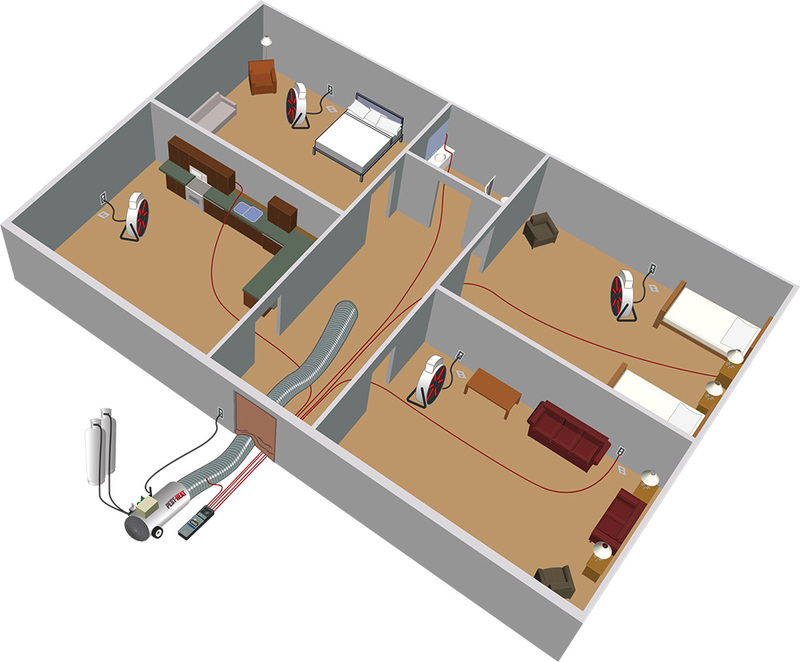 Temperatures are then consistently monitored and recorded remotely from numerous temperature sensors placed strategically throughout the room. This safe, chemical free approach is the most efficient and environmentally friendly heat treatment method for insect eradication. Our custom-designed, portable electric or propane forced-air heaters deliver high volumes of heat. The heaters are placed within the targeted area, introducing and re-circulating heated air for maximum efficiency. Portable fans with high temperature and high CFM, variable speeds and low amp draw are utilized to distribute the heated air evenly throughout the space and target high infestation zones. Probes and sensors are used to track the heating progress and to ensure proper heat penetration in all places where bugs can take refuge. The system allows heat to penetrate behind cracks and into crevices, ensuring that pest eradication is a complete success. Pest-Heat offers the TPE-51-C, 204,000 BTU/h portable electric heater package that is designed for immediate set-up in a minimal amount of time. This package includes four 15kw, 3-phase portable high temperature electric heaters, with 100' of 6/4 power cord per heater and 50 amp cam locks that plug into a six-outlet waterproof distribution box. Four 20" high temperature fans, and wired or wireless temperature monitoring equipment complete the package. The electric heaters are designed to be installed inside the space, re-circulating the dry heated air without the need for ducting. 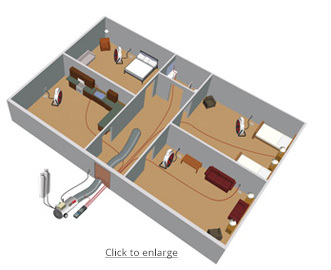 The heaters can be left unattended, while the temperature is remotely monitored. Temperature is precisely controlled thermostatically on each heater, allowing the operator to maintain the desired temperature levels at all times. 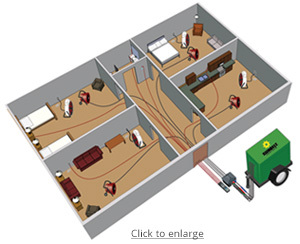 Our propane heater package offers you a cost-effective solution for pest eradication. This package includes the TPE-500, 500,000 BTU/h, single-phase portable propane heater, complete with high temperature flexible duct, quick connect propane fitting for easily connecting two 100 lb. propane cylinders, four 20" high temperature fans, and wired or wireless temperature monitoring equipment. The propane heater is installed outside the area being treated where the heater(s) can be easily monitored. 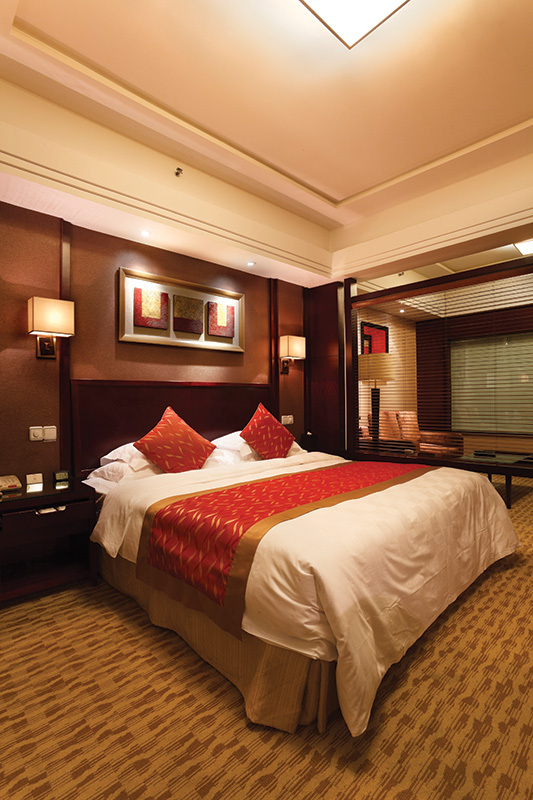 Warm air is ducted into the area and the heat is distributed throughout the space utilizing high temperature fans. Temperature is precisely controlled thermostatically on each heater, allowing the operator to maintain the desired temperature levels at all times. The easily portable propane heater will provide years of dependable, reliable, and efficient operation. This package ensures the proper amount of heat needed for those hard to reach areas, especially when treatment is performed during cold weather. Having the proper amount of heat is crucial for a thorough and total eradication. 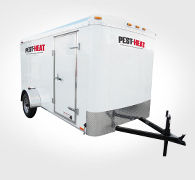 Pest-Heat offers 10’ and 12’ lightweight, durable, aluminum cargo trailers to easily transport and maneuver your propane or electric heat treatment packages. We can custom design your trailer and outfit it with the necessary Sunbelt Rentals generator, specific to your electrical needs. 877-234-5630 to customize your package. When a camp has bed bugs, rumor travels fast and we didn’t want to lose any kids for the upcoming summer. We had to find a quick solution that was safe and cost-effective. After researching online for what our best solution would be, we found Pest-Heat. Our camp bought the propane package, which will allow us to do ongoing treatments. The entire heat treatment process worked out smoothly and we would recommend Pest-Heat to any other camp experiencing bed bug issues. When looking for a sturdy container for our pallet heat treatments, we went with Pest-Heat due to the outstanding heating capability of the PH-2000 heater running off of propane (or natural gas). Pest-Heat’s container is lined with 24 gauge-galvanized steel attached to the interior liner. Pest-Heat has dependable customer service and equipment. It worked great for our needs and we have been using it for over 8 years! 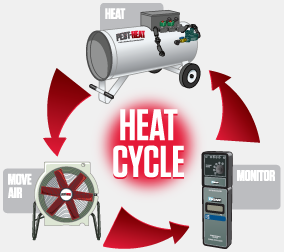 Pest-Heat offers convenient training on-site at your facility. Training is also available at our Aston, PA facility. Training packages include equipment overview, operator training, proper set-up, installation of equipment and teardown, computer and detection monitoring, safety, preventive maintenance, service of the equipment, and completion of treatment.